Question 4 is incorrect on the CPD page. The correct answer is B not C.
Abstract: By utilizing the ‘stages of change’ approach to smoking cessation an individual’s willingness to quit smoking can be ascertained, with provision of knowledge on potential interventions empowering patients to make their own decisions on cessation modalities. Nicotine Replacement Therapy (NRT) can reduce physical cravings, pharmacotherapies can reduce the desire to smoke, stop smoking services can provide smokers with interpersonal support and electronic cigarettes are increasing in popularity but cannot be recommended as a completely safe way of delivering nicotine. Interpersonal support in combination with NRT and/or pharmacotherapy is the safest and most successful method of smoking cessation. The authors are developing an online resource to assist with smoking cessation advice. It is available at http://www.smokingcessationtraining.com/. Clinical relevance: For a patient who is amenable to brief cessation advice, the stages of change model allows the dentist to adapt brief advice to the patient’s current circumstances. 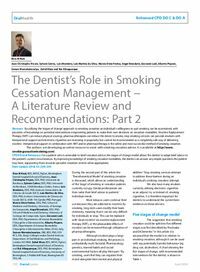 By improving knowledge of smoking cessation modalities, the dentist can answer any simple questions the patient may have, signposting them towards specialist cessation centres when appropriate. Author notes: Ross M Keat, BDS, MFDS, PgCert, Birmingham Dental Hospital/School of Dentistry, Jean-Christophe Fricain, DDS, PhD, Université de Bordeaux, Sylvain Catros, DDS, PhD, Université de Bordeaux, 33000 Bordeaux Cedex, France, Luis Monteiro, DDS, PhD, Instituto Universitário de Ciências da Saúde (IUCS), Luis Martins da Silva, DDS, PhD, Instituto Universitário de Ciências da Saúde (IUCS), 4585-116 Gandra PRD, Portugal, Marcio Diniz Freitas, DDS, PhD, School of Medicine and Dentistry, University of Santiago de Compostela, Angel Brandariz, DDS, PhD, School of Medicine and Dentistry, University of Santiago de Compostela, Spain, Giovanni Lodi, DDS, PhD, Dipartimento di Scienze Biomediche Chirurgiche e Odontoiatriche, Alberto Pispero, DDS, Dipartimento di Scienze Biomediche Chirurgiche e Odontoiatriche, Milan 20142, Italy, Saman Warnakulasuriya, OBE, BDS, PhD, FDS RCS, DSc, King’s College London Dental Institute, Department of Oral Medicine and Pathology, London SE5 9RW, Zahid Khan, BDS, MFDS, PgCert, Birmingham Dental Hospital/School of Dentistry and Rui Albuquerque, DDS, PhD, Birmingham Dental Hospital/School of Dentistry, University of Birmingham, 5 Pebble Mill Road, Birmingham B5 7EG, UK.